I present to you some of the weirdest, most outlandish Asian flavors. Two words came into my mind when I first read about this dish: CHOKING. HAZARD. As you pour the sauce over the little tentacles, you could clearly see that they're still very much alive. With suction cups and everything. Seriously, be careful if you're ever faced with this dish. Yes, you read that right. The word shirako literally means "white children", a reference to sperm. This is basically a dish made of tiny fish penises, with all the fluid still in it. It seems as though the Japanese are on a quest to taste every nook and cranny of a fish. Sperm? Eyes? (I'm just kidding) Those brave enough to have tried this dish shared that the texture is quite rubbery. This is a delicacy made by boiling silkworm larvae into a mushy texture. It's usually cooked with sugar and soy sauce to further enhance the flavor. These are eggs preserved in clay and salt for a period of time, usually for few weeks to a few months. "Century" is just a hyperbole. (*Note: although khai yiao ma is the Thai term for "horse urine eggs", these are not made by soaking them in horse urine. They got their name because of the supposedly pungent smell. Horse urine would just bring them to an entirely new level of bizarre.) Personally, I think century eggs are pretty good! Try them with congee (Chinese porridge) and you'll probably change your mind about its initial repulsiveness. I love potatoes. I am thankful for the many ways we can eat them. Thanks to India, we've got another addition to the list. (Although, I think I'll have to pass on this one.) The potatoes are left to rot and are then harvested to be cooked with different spices. A crunchy treat patronized by many. 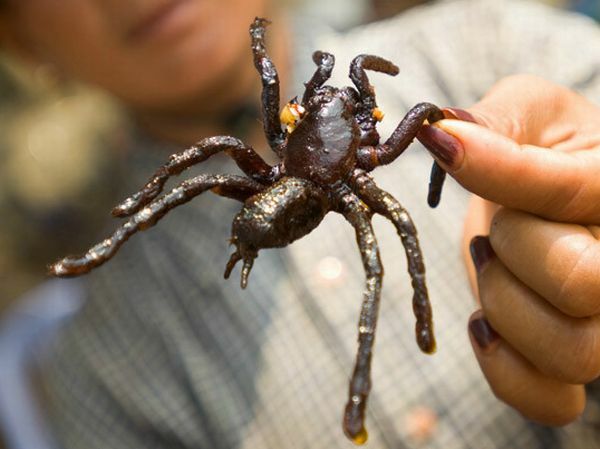 The streets of Cambodia are dotted with merchants carrying baskets full of these deep-fried spiders. Brave souls who have tried this delicacy say that it does not at all taste like chicken. (Well, duh!) I don't know about you guys, but I don't want these little guys around, dead or alive. In Chinese medicine, turtle shell jelly is said to "up your yin" and "down your yang". This is a favorite summertime dessert in China. Condensed milk or honey is used to mask its bitter flavor.